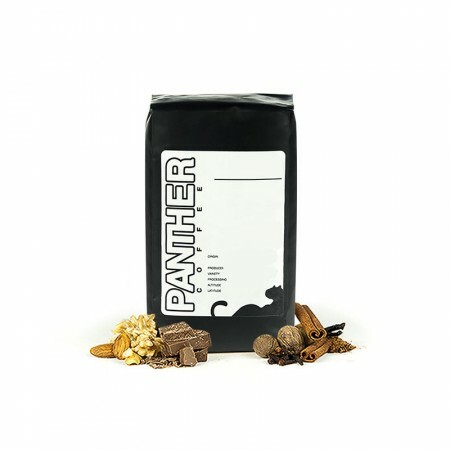 This is the Mountain Water Decaf brought to you by Panther Coffee. This coffee was sourced from the coffee growing region of Guaxupé, Minas Gerais in Brasil. This Mountain Water Decaffeinated coffee from Brasil is balanced with a mix of chocolate and honey-like sweetness. Trying to do less caffeine and really enjoyed this except with some added milk and/or honey to soften it as it seemed too over roasted for my taste. I usually drink my coffee black. Enjoyed it iced! Had a strong, distinct flavor that differentiated it from other decafs. I love it. Did not quite figure out the grinding size for this one, but the first short was very tasty. This coffee is amazing both hot and iced. I love how smooth the cocoa and nut notes are, and the brief fruity aroma I get when it's super hot.